Love them or hate them, Brussels sprouts are a pretty addition to a winter festive table. But they do have a certain dubious reputation. At least here in Britain. Right now folk on the radio – okay, BBC Radio 2 – are asking the annual foodie question: are your sprouts on yet? This ‘banter’ starts in, oh, November. Yes, more than any other vegetable, sprouts get a bad rap. Even if you don’t like them, sprouts are not only healthy they are also quite good for playing table football – soccer or American-style. 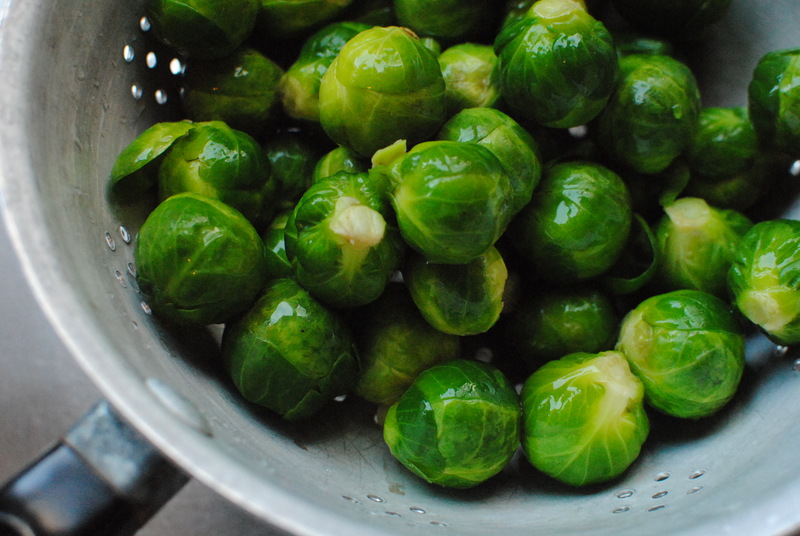 Joking aside, Brussels sprouts briefly boiled or steamed, then sauteed in olive oil or butter until just starting to frazzle, are a world away from the mushy, stinky horrors of your youth. 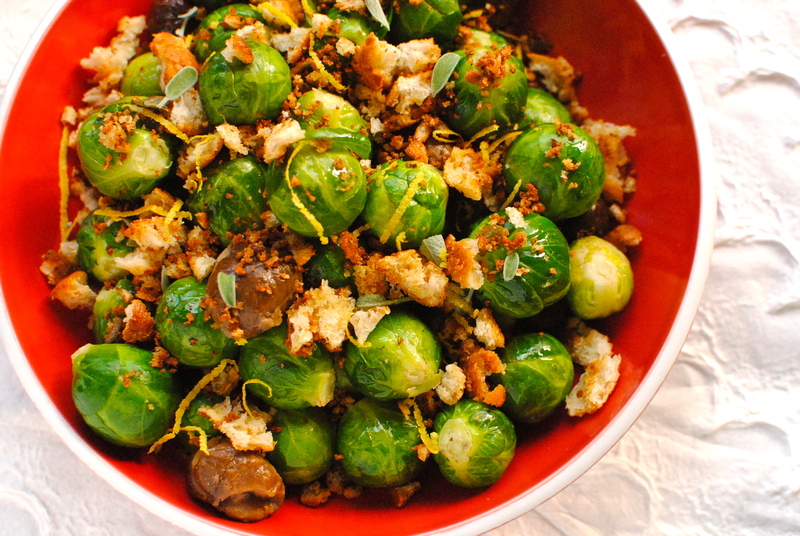 Blanket them in crispy ciabatta and sage crumbs, and Brussels get their festive hat on. Simple, but effective. Although I like them only briefly acquainted with the steamer, cook them longer if you like them on the soft side, or if it makes them easier to eat. Whiz up any leftovers (crumbs too), mix in a beaten egg, and pop them into a small, oiled baking dish with a few grates of flavourful cheese to make a baked savoury pudding. Brilliant with a rasher or two of proper butchers’ bacon. By the way, you know how I recently wrote about buying local? Well, one thing that I’m giving this year that is definitely not local are micro-loans. All of the adults on my little list are getting a card with a unique number that allows them to support a business venture of their choosing. I have gone through Kiva, the not-for-profit organisation that hooks up those of us with a bit of money with those who don’t. 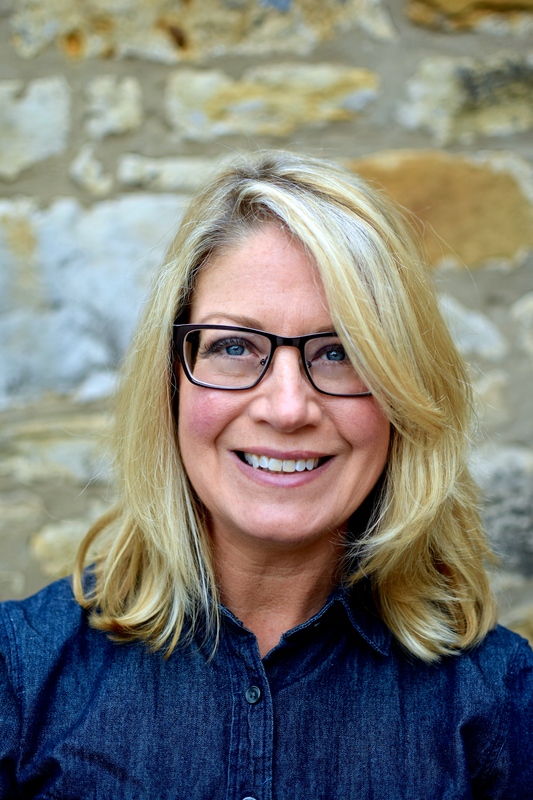 They do this by working with “microfinance institutions on five continents to provide loans to people without access to traditional banking systems.” Mostly Kiva helps people like you and me support people setting up new businesses. There are thousands of businesses and projects to choose from: from bull buying in Peru to purchasing food supplies for a non-profit community restaurant in Belize. You can even support writers and help build a shop. Previously I have given money to actually purchase such items for those who need it. You know, like goats and seeds. But this sounds really good as it is helping people in a different, and more long term, way. Loans start at $25. You can choose whether you want the money back, or re-loan it to another business or project. Other such ‘brokering’ organisations are around, such as lendwithcare.org. But you can also go straight to the individual microlending institutions themselves. Here’s a list from Forbes of the top 50 lenders, including assessment of risk. As my loans were on the lower end, shall we say, risk wasn’t an issue. I chose to go through Kiva as I had heard good things about it from someone who works on economic development projects in sub-Saharan Africa. Certainly a unique present! I am popping this over to Karen at Lavender and Lovage who is this month hosting Simple and in Season for Ren at Fabulicious Food. Are you giving anything unusual over the festive season? What are your memories of sprouts as a child? And were you scarred for life? If you are up for more sprout recipes perhaps check out bbcgoodfood, or if you want to get fiddly, here’s one for the more dextrous among us from Heston Blumenthal. Festive Track of the Week: Christmas Time is Here, by Correatown – get your folk on! If you don’t feel festive after listening to this, there is no hope for you. Love this! A wholesome and pretty side dish that is a good foil for the richness of the rest of the festive meal. If you don’t fancy the chestnuts, how about adding in a handful of sunflower seeds for an unexpected nutty crunch? See below how to make this ahead. Put the sprouts into a pan of boiling water, bring back up to the boil and cook for between 5 and 10 minutes, depending on how well cooked you like your sprouts. Any longer is a sulphurous disaster, in my opinion. You could also keep the nutrients at their tippy toppest by steaming for the same amount of time. Drain and blast with some cold water from the tap to stop them cooking, and to keep the vivid green colour. Leave to drain and dry a bit. 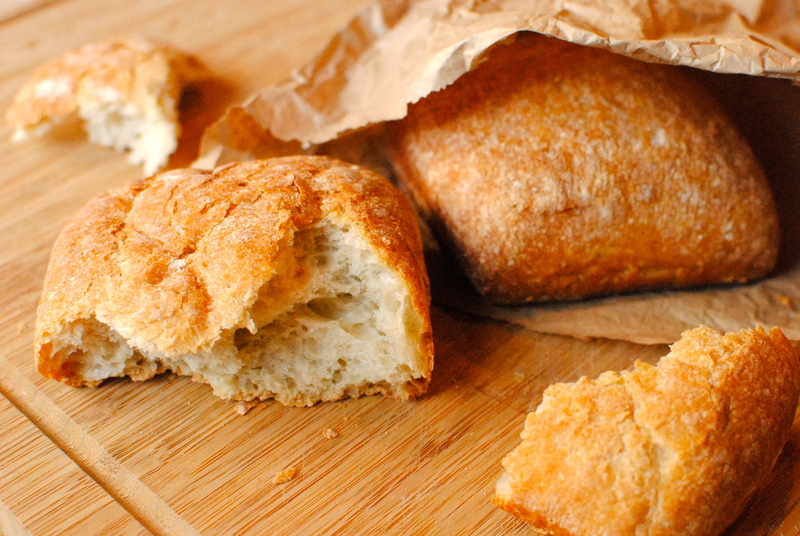 While the sprouts are doing their thing, tear up the crustless bread and pop in to a food processor, along with the smoked paprika and a good pinch of salt and pepper, if using. Whiz this up until you get a crumb size that you like (not too dusty though), adding in the sage in the last pulse or two. Add 1 tbsp of olive oil, or a small knob of butter and a tsp of oil, to a sauté pan and heat over a medium flame. Add the crumbs (they will sizzle) and stir them around to coat. Saute the crumbs until they start to brown – about three or four minutes. Mix in the lemon zest, check the seasoning and set aside in a bowl. Heat 1 tbsp of olive oil over a medium to high flame and tip in the cooked sprouts, as well as the chestnuts, if using. Stir fry until just starting to ‘catch’ in places then add the lemon juice and cook until the juice just absorbs. Decant the sprouts and chestnuts into a warmed serving dish and scatter over the crispy sage crumbs and zest, adding more fresh sage to garnish. This also tastes great with well-cooked bits of good bacon. Get ahead: You can do most of this the day before. Sauté and cool the crumbs, storing in a container until ready to use; cook and cool the sprouts, and store. When ready to eat just stir fry the sprouts and chestnuts as directed, topping with the crumbs before serving. Why thank you. I never knew sprouts would be of interest to anyone. What do I know? I’m a big sprouts fan but the hubby isn’t…but when i make them together wtih generous amounts of bacon he seemed to be able to swallow it! Next time I will add the sage 🙂 Thank you for sharing the info regarding the micro-loans this looks like something I would like to get involved with! Oh gosh! And I probs made you feel bad with my reply. Oops! No, you are fine. I eat meat, my About mentions healthy omnivore somewhere, it’s just that for the past year it has been a veggie vibe in tune with my healthy (pun intended) vegan readership. Bacon, the good stuff, is fine in my book as a wee occasional treat. Do try the bacon crumbs thing. And chorizo whizzed and added to panko crumbs and slapped on homemade fish sticks is a keeper too ;D Thanks so much for commenting, as always. Mmm this recipe looks fantastic. 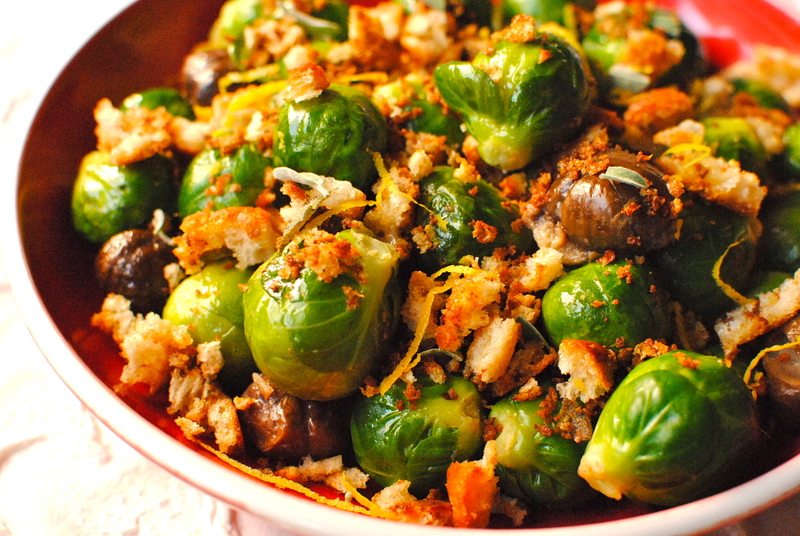 I love how comforting brussel sprouts can be in the winter months! Learned the hard way that you can’t cook sprouts beforehand and heat them up…soggy city. Kiva and the other organisations of its ilk are a superb way of feeling like you are doing something useful at a time when we all get stuff we don’t need or necessarily want. That said, i wouldn’t turn my nose up at a shiny new macro lense! Shallow, or what? great recipe! my husband is a big fan of Kiva – that is a really cool thing to do! You are too funny, girl! I knew what you meant. I wouldn’t think you would go to all the trouble to write in and diss me (others might perhaps?). I am always questioning whether I have inadvertently insulted someone while commenting. I love brussel sprouts. I am lucky that my Mum is a great cook and never overcooked the veg. I got my sons to eat them by shredding them and stir frying with bacon lardons. Shredding and stir-frying with bacon lardons is always a winner. My mum never cooked sprouts but I remember them at school occasionally (that and lima beans), although they are more of a British thing, I think. We never got cold enough to grow them in Florida so we would have made do with some ‘imported’ (from Michigan?) stuff. I actually made a very similar recipe at work for a food demo. It was a HUGE hit, and I was surprised because I didn’t know many people liked brussel sprouts. I love them, love love love. Oh yes, I heard about Kiva yesterday on the radio, sounds brilliant. That’s great you are taking part this Christmas. As for sprouts, I love them! They are up there as my fav veggie along with broad beans! Your recipe looks delish and I am reading this before 8am! My most unusual Christmas present is from Scotlands DNA where you can check out your genes from way back (back to around 600AD!) and discover where your ancestors came from – fascinating! We will read the results on Christmas Day so the convo should be pretty interesting! A lovely sprout recipe Kellie and the gift initiative sound really intruiging. We’ve sponsored a child to go to school in Ethipoia through our local church and no doubt I will pop into Oxfam for some gift cards. My son also raises money with his class at school and they all chose something to buy collectively. Last year they bought a cow! Thanks for your kind comment, Ren. I love the way giving in this way, through sponsorships and through buying products to use or give, is now so mainstream, and not at all seen as trendy or elitist. So many ways to feel like you are doing something. I’m a big fan of sprouts – they work a treat with a few key ingredients. I tend to have them with pancetta, garlic and chestnuts but I love your sage crumb twist Kelly! We like them with pancetta too. Will have a bowl of each on the table. Have a wonderful Christmas. Thank you for sharing this Holiday Side Dish Special!